Somewhere in the depths of middle America, on a list of courses offered by the University of Lower Someplace, there just might be a subject entitled Social Impact of the Fifty Seven. If that intor is true, could whoever teaches this doubtlessly oversubscribed subject to rooms filled with nostalgia-crazed Billy Bobs and Peggy Jeans please explain why North Americans have such an affinity for this particular Chevrolet model? Some commentators blame the unloved design of the '58 model for its predecessor's popularity but it's more likely 1955-57 Chevrolets carry fond memories as the first car owned by thousands of North American baby boomers. But that is certainly not the only reason why top-quality '57s typically achieve higher values than a host of rare and super-desirable 1960s muscle cars. Appearing in showrooms during October 1956, Chevrolet's '57 range represented the most daring model produced to that time by General-Motors' most prolific brand. But, apart from styling that mimicked the fin-tailed profile of contemporary Cadillacs and an optional, fuel-injected engine, the '57 was neither remarkable nor rare. More than 1.5 million were built and they sold in the US at prices ranging from $1996 for a two-door 150 to $3100 for a fuel-injected Sport Coupe. 100km/h took close to 15sec. 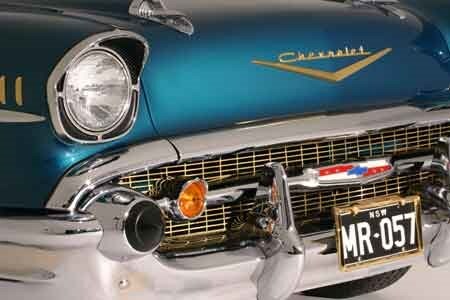 Incredible as it might seem for a car that sold 1.5 million, the '57 Chev was commercially disappointing for GM. Sales were down by six per cent on 1956; a price rise of seven to 10 per cent coupled to Ford's release of its rebodied Fairlane major contributing factors in the stifling of Chevrolet sales. 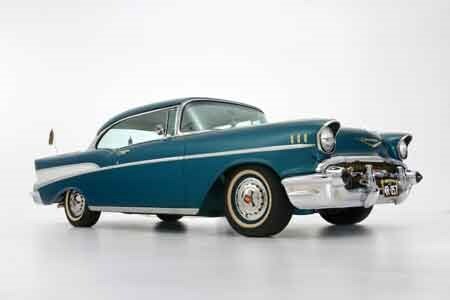 North American '57s came in three model variations - the basic 150, mid-range 210 and up-market Bel-Air. 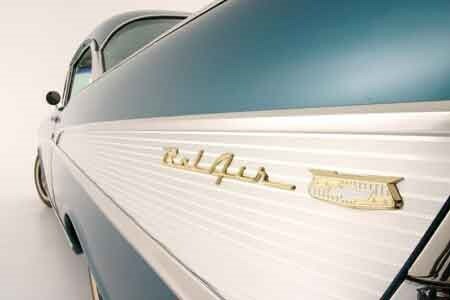 Distinguishing between the 210 and Bel-Air requires a reasonably keen eye as both are laden with chrome, however the distinctive ribbed aluminium rear fender 'fillet' was a Bel-Air only option. Body styles available to US and some export markets included two and four-door sedans and hardtops, convertibles, two and four-door wagons and a delivery van. 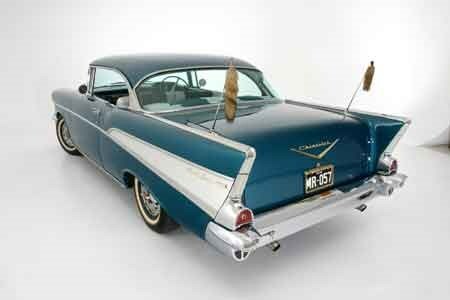 V8 engines were available on all '57 Chevrolet models and 67 per cent of the cars built were V8 powered. The others used a 3.9-litre Blue Flame six-cylinder engine that first appeared in 1950. Two-speed Powerglide automatic transmission was optional and supplemented by a new Turboglide transmission with an extra 'hill retarder' ratio to assist downhill braking. Options were numerous and included power steering, air-conditioning for V8-powered cars, power-operated convertible top and a Continental kit that allowed the spare wheel to be mounted on the rear bumper. Most significant and expensive among the optional items was the fuel-injected, 4.6-litre V8 that cost $484 and was claimed to produce 1hp for each of its 283ci of engine displacement. Australia imported very few V8-engined '57s until the 1980s, when relaxed import regulations and favourable exchange rates brought an influx of cars. Among the cars offered through Unique Cars as the classic vehicle boom of 1988 gathered momentum were a decent-looking Bel-Air Hardtop at $17,000 and a show-winning convertible at $75,000. The vast majority of pre-1990 imports were converted to right-hand drive; often using parts from discarded local sedans. More recent conversions are superior in quality, however many owners now choose to preserve the integrity of their vehicles by leaving them left-hand drive. Locating a '57 Chev that will typify this diverse and frequently modified car is a difficult task. Personal experience of the model dates back almost 30 years to a blue, GM-H-assembled sedan with imaginary shock absorbers that lurched about on threadbare crossply tyres. Today, a '57 in that state of disrepair would be hard to find and as typical of the breed as Victor Bray's drag car. According to Michael Rich, who with wife Stephanie undertook a nut and bolt restoration of their Bel-Air Sport Coupe, there is no comparison between a totally rebuilt car and unrestored originals. "This car is so tight and rattle free that I'd prefer driving it to the latest Calais. Even with all the windows down it's really quiet and comfortable enough to drive to Perth." The Richs' car runs a mildly-modified 283ci (4.6-litre) engine with a Turbo 350 transmission replacing the original two-speed Powerglide. The front drum brakes have been replaced by Holden discs but the remainder of the chassis and drivetrain are original. "During the restoration I sent the springs away to be reset and when I refitted them to the car, one of the leaves was cracked," Rich said. "The place where I sent them would only replace the cracked one, so I had two complete spring sets custom made." Michael Rich specializes in remodelling LHD dashboards for use in RHD conversions and warns potential buyers to carefully check the heater installation. "Changing the heater over is the worst part of converting a '57," he said. "The heater box takes up half of the firewall and to make it work properly and look right takes an enormous amount of work. Some people just turn it upside down and redo the connections but that just creates a lot of problems down the track." The steering on cars that have been converted should be light without excessive free play. The manual steering box fitted ex-factory has five turns lock-to-lock and cars with significantly fewer will be arduous to drive, unless equipped with power steering Mechanical accessibility and simplicity are outstanding and most regular maintenance will be within the capabilities of the average home mechanic. Mechanical, body and trim parts are available both here and the US. 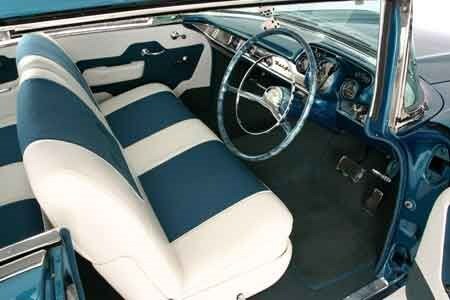 The leather with cloth trim in our featured '57 is the work of Mick Talbot at Fx Trim in Sydney, although Michael Rich had to hand-build a rear seat frame as the original was missing when his car arrived from the US. Many cars available in the Australian market have been fitted with later model engines, transmissions or both. The vast majority are now three-speed automatics - GM's highly rated Turbo 350 transmission is a popular choice - with three and four-speed manuals reasonably rare. Astronomical values for '57 Chevrolets aren't confined to the brightly lit theatre of US auction rooms. According to long-time Chev enthusiast and trader, Wayne Barber, values for cars on the Australian market have doubled during the past 10 years. "During the mid 1990s it was nearly impossible to sell a top-class Bel-Air sedan for more than $20,000 and $50,000 was the most you'd get for a good convertible," Barber said. "Hardtop Bel-Airs in really good condition are now close to $70,000 and you won't buy a top-quality convertible for under $120,000." Those values are supported by recent US auctions, where trophy-winning Bel-Air convertibles sold for more than $US70,000 and Hardtops of similar standard between $US35,000 and $US50,000. Unrestored two-doors in reasonable condition are available on the Australian market at less than $30,000 but undertaking a ground up rebuild on such cars can push overall costs well beyond $100,000. Finding a locally delivered six-cylinder car is difficult, as the majority have been modified to some degree and now usually come with a non-standard V8 engine. An original car in good condition is likely to cost $15,000-$20,000 with altered cars $5000-$15,000 dearer. Rust attacks in a variety of areas - lower edges of front and rear guards, inner sills, firewall (inspect from under the dash), window surrounds, floors and rear spring attachment points. All body parts are available from a variety of US and local suppliers. Damaged or missing brightwork is very costly to replace (a new front bumper from '55-57 Chev specialist Danchuk is listed at $US500) so examine carefully all chromed or polished components for dents and pitting. Stainless mouldings can usually be repaired (contact Michael Rich on 0415 861 313). Any engine you are likely to find beneath the bonnet of a '57 Chev should be an extremely reliable device. Replacement blocks for early 265/283 motors are difficult to find but many Australian domiciled '57s have been fitted with derivative 327 or 350 small block V8s. Normal checks for leaks and smoke are advisable. According to Wayne Barber, original differentials are prone to failure when engine output is significantly increased. A conversion using the durable Ford nine-inch centre is available. Automatic transmissions - the original two-speed or later three-speed often fitted to modified cars - are extremely reliable. Manual cars with the original three-on-the-tree transmission are prone to gear selection problems due to worn linkages. The standard drum brakes aren't up to the rigors of modern driving and cars with a front disc conversion are preferable for regular use. Holden discs of the 1970s are easily adapted, as is the brake booster from six-cylinder VH Valiants. Rear leaf springs crack, as do the mounting points. Simplicity is the key to '57 electrics, so the more features that have been added (electric windows, power top on convertibles etc) the greater the probability of component failure. Fuel gauges are unreliable and can show a quarter full when the tank is empty. Original trim materials are not available but good facsimiles are. 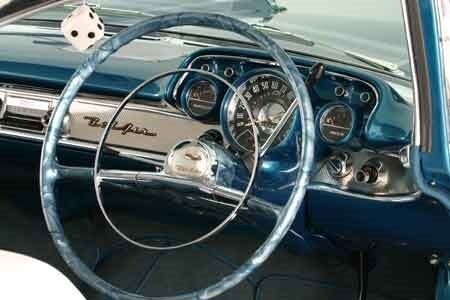 Original dash knobs, dials and radios can be obtained second-hand but are not cheap. Look under the floor coverings for dampness caused by rust, leaking door seals and heater connections.